Looking for a Honda Express moped scooter? 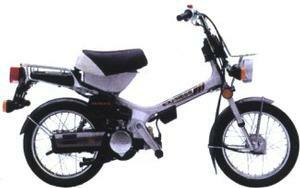 The Honda Express moped was made by Honda between 1977 and 1983. Variants include the Express, Express II, Express SR and Urban Express. All versions of the Express line are powered by a fuel efficient single-cylinder two-stroke 50cc engine. The Express was designed to be simple to operate, with an automatic transmission and self-mixing system.